PHRYNE represents one of the most traditional and detailed 50m sailing yachts to be delivered from Perini Navi. A wonderfully maintained sailing yacht in top condition, her current and original Owner has collected many antiques from all over the world, making her classic interior especially unique. Like all the Perinis of this size, she offers maximum comfort for all guests and has the capability to cruise worldwide. United Yacht Sales New Jersey would love to guide you through a personal showing of this 160' Perini Navi 1999. 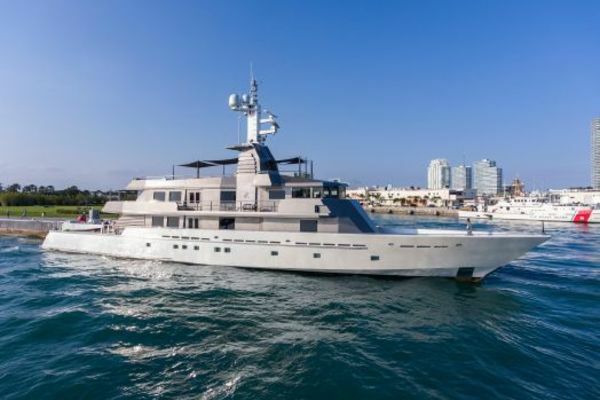 This yacht for sale is located in Barcelona Spain and priced at $9,900,000. For a showing please contact us by filling out the form on this page and we will get back to you shortly! DIMENSIONSLength overall: 49.80m / 164 ftWaterline length: 41.27m / 135.3 ftBeam: 10.27m / 33.7 ftDraft: 3.37m – 8.37m / 11 ft – 27.4 ftDisplacement: 493 tons (full load)Gross tonnage: 436 tonsNet tonnage: 131 tonsCONSTRUCTIONHull: Steel, Flag blue Awlgrip hullSuperstructure: Aluminium, Oyster whiteDecks: TeakNaval Architect Perini NaviExternal Designer Perini NaviInternal Designer Perini NaviCLASSIFICATIONClass: A.B.S. A1 Yachting Service + AMSMCA: N/AOther: N/APERFORMANCEMaximum speed: 15 knotsCruising speed: 13 knotsConsumption (approx): 280 lph @ 12 knots approx.Range: 3100 nm @ 13 knotsRIGGINGRig: Phryne is ketch rigged with aluminum main and mizzen masts built by Perini Navi, with rod standing rigging built by Ocean Yacht Systems. All rod rigging replaced 2009 by BSI Denmark.Masts: 49m aluminum main mast35m aluminum mizzen mastSpreaders: 6 x Main Mast – 4 x Mizzen MastBoom/s: AluminiumSpinnaker boom: N/AReefing system: In mast furling SAILSSails: -Sails are handled automatically by Perini Navi systems, concentrated on a single console at the wheelhouse, duplicated at the fly bridge where the helmsman can single handedly operate the entire system to set sail area, sail trim and furl or unfurl the sails, ease or tension the sheets, tack or jibe. A dedicated monitoring system allows continuous verification of sail system status, operational alarm interpretation and system parameter settings, including a histogram function.-Mainsail, Mizzen, Staysail, Genoa, Fisherman by Quantum-MPS by Doyle.-Total sail area 13,870 sq ft / 1.289 mqForesails: Staysail and GenoaMainsails: Main mast height above DWL 168.6 ft / 51.4mGenoa & staysails: Genoa and staysails are furled on electric furlers with manual back up.Mizzen: Mizzen mast height above DWL 130 ft / 39.65mThe main and mizzen sails are internal mast furling with electric furlers with manual backup.Winches: 12 x Perini Navi captive reel winches with load cells for sheet tensions are used to handle all the sails and are controlled by the Perini Navi sailing system at the wheelhouse and fly bridge.KEELType: Swing keel with 20t ballast.MACHINERYEngines: 2 x Deutz TBD616V12, 720 kw at 2100 rpmEngine hours: 17,235 hrs Stbd – 16,960 hrs Port (Sept 2017)Generators: 3 x Northern Lights M668A 380V/50Hz 1500rpm 80kw generators in sound shields.Mase PD 70Y 230v/50Hz 5KYanmar L100 – AE 6.6Kw @3000RPMGenerator hours: G1: 16,698 hrs (Sept 2017)G2: 16,809 hrs (Sept 2017)G3: 15,670 hrs (Sept 2017) STEERING & PROPULSIONSteering: Marsili hydraulic steeringPropellers: Frances Helices feathering controllable pitch shafts with variable/reversible pitch propellersGearbox: ZF BW250AUXILIARY EQUIPMENTBow thruster: Schottel 75kwStern thruster: N/AWater maker: 2 x Idromar reverse osmosis water makers, 9600 l/day eachStabilizers: N/ABilge water treatment separator: YesFuel separator: Alfa Laval MAB103 fuel centrifugeAir-conditioning: Condaria 120,000 BTU air conditioning fan coil units with (2) 20hp compressorsWater sterilizing lamp: IdromarWaste water treatment: Hamann, IMO approved sewage treatment plant (new mixer pump 2015)Oily water separator: Veolia with OMD 24 ppm alarm and measuring cellToilet system: Jets vacuum toiletsBoilers: Gianneschi 2 x 300L 6KwOther: -Sound Down exhaust silencers.-Halyard silicone exhaust hoses.-Class required spare parts and tools as well as extensive additional spare parts for remote global cruising.- Elcocell antifouling system (Nov 2016).TANKAGE (approximate)Fuel: 45,700 lLubrication oil: 1,530 lDirty lube oil: 1200 l Fresh water: 13,000 lGrey/black/sludge/bilge water: 7,500 lOther: -Safe tender fueling station in lazarette, plumbed directly to main day tank supply.ELECTRICAL SYSTEMVoltage: 380V/50Hz three phase220V/50Hz single phase for lighting110V/60Hz (some 110V systems onboard but not domestic use)24V AC/DC for emergency lights, electronics, etc.Converter: 50 kVA Atlas frequency converter110V/60Hz Atlas converterShore power connection: 80 kVA Shore power converter: 380/400Inverter: 380/400Batteries: Start 24v system: 4x Exide Dual AGM EP 1200 12v (240Ah)Other: Master Volt rectifiersVariable speed drivers for furlers, winches, exhaust, extraction and ventilation fans, bow thruster, a/c compressors and windlasses etc.NAVIGATION EQUIPMENTMagnetic compass: C. Plath Jupiter magnetic compassGyro compass: C. Plath Navigat X MK1-GM Gyrocompass with analogue repeaters (new 2013/2014)1 x Gyrocompass analogue repeaterLog: B&G Hercules 2000 Sonic Speed XTL - FinDepth sounder: Furuno CVS FCV - 611Sonar: B&G Hercules 2000 SoundersAutopilot: -C. Plath Navipilot V/GM autopilot system-1 x Navipilot V HSC/GM autopilotRadar: 2 x 96 nm Furuno FR1510 MK111 - X Band radar with 4' antennas interfaced with gyrocompass through AD100 and with GPS through an NMEA Distribution BoxElectronic chart system: 2 x Furuno ARPA AutoplotterGPS: 2 x Furuno GP80 MKIII GPS unitsNMEA distributor for GPS signal feed to: 2 x Furuno FR1510DA MKIII radar1 x Furuno FMD 8010 remote display1 x B&G Hercules 2000 series1 x Sea Pro 2000 ECS (Dedicated PC on Bridge)1 x JRC - Immarsat C Model JUE-87Instrumentation system(wind speed & direction): Furuno Fax 208 weather-faxOther: -Electronic compass-Interface connections to ARPA radar, GPS, autopilot, wind instruments, etc.-1 x 3 push-button steering mode control (Auto/Hand/NFU)-1 x Override/take-over unit-2 x Tillers NFU (starboard and port) - in process of replacing on fly bridge-2 x Rudder/angle indicator (starboard and port)COMMUNICATION AND SATELLITE EQUIPMENTV-SAT (Seatel) - Dome fitted 2009- New Modem fitted 2016 – I direct x 7 - New Switch fitted 2016- Network Management System + AP's (AC classification 2015)Inmarsat: Sat C Navtex: Furuno NX 500Fleet 77: Replaced by FBB Broadband Internet FBB and Shore connection Pepwave 4G aggregatorGSM: N/ASSB radio: Skanti TRP 8000VHF: Simrad RS82Mini M: TT – 306 4ATelephone exchange: Panasonic Digital Super Hybrid SystemVHF hand held radio: 6 x ICOM Printer / fax: HP Officejet Pro 276 DWENTERTAINMENT EQUIPMENTTV/ DVD: Christie LHD 700 2k Projector Main SalonPanasonic BluerayAll cabins have 22’ TV (2012) and Bluray (2016)Satellite: N/AMusic system: Main Salon: Marantz NT1605 receiver – Audio access PX600Multiroom, Sonos Docks, 5 x James Cube SpeakersAft Deck: Nad Amps, Kef ceiling speakersFly Bridge: Nad Amps, Bose Marine SpeakersDOMESTIC APPLIANCES, EQUIPMENT AND LAUNDRY Refrigerator/Freezer: Frascoldi refrigeration, walk-in freezer. All evaporators replaced in galley (May 2017) Oven: Miele H 5081 BP (Fan Oven) and 1x Steam OvenStove: Miele KM 6226Microwave: Samsung CM1069Icemaker: Hoshizaki IM 25LEDumb-waiter: N/ADishwasher: 2 x Miele G7766 / M 25LEWashing machine: 2 x Miele PW6065 (2017)Dryer: 2 x Miele PT7136 (2017)Other: -Ceccato air compressors and air drier (replaced 2016).-Compressed air horn.ACCOMMODATION 8-12 guests in 4-5 staterooms and 9 crew in 3 cabins Phryne sleeps eight (8) guests in four (4) double staterooms, all with en-suite and an additional two (2) to four (4) guests or children in the owner's sitting room to starboard of the master stateroom and in Pullman berths in two of the guest staterooms. Phryne’s main accommodation deck features large and comfortable spaces appointed with parquet inlaid floors, polished mahogany paneling and beveled glass doors. For dinning and entertaining there are both formal and informal areas allowing for comfortable seating for 10. Also on the main deck she has a game room, day head and crew pantry. Master StateroomThe owners stateroom below is full beam and very spacious featuring mahogany and fabric wall panels accented with gold fixtures and marble counters. Guest StateroomThe three guest staterooms are appointed in the same elegant fashion.Crew AccommodationNine (9) crew are accommodated in three (3) double cabins and one triple cabin. DECK ARRANGEMENTPhryne represents one of the most traditional and detailed 50m sailing yachts to be delivered from Perini Navi. Her design provides all the features of her larger 56m Perini sisters including a large protected cockpit, main deck pilothouse, expansive fly bridge, side shell boarding platform and sophisticated sail management system allowing one person to control all aspects of normal sail handling. Wide teak decks allow easy access forward and aft and a huge foredeck provides deck space for two 5m tenders. DECK EQUIPMENTAnchors & chain: 2 x Stainless Steel Poole type anchors, 570kg each2 x Alloy Fortress stern anchors and assorted lengths of chain1 x Galvanized Reef anchorAnchor lights and day shapesWindlass: 2 x Nanni anchor windlassesPassarelle: Stainless hydraulic passerelle with lights, door bell and intercomBathing ladder: -Starboard side hydraulic boarding ladder, flush mounted, self-leveling stairs, with lower swim ladder, lights and shower (rebuilt/overhauled including ramps limit switches and lower assembly 2016).-Shell door swimming platform with lights, shower, swim ladder, bull bars, and retractable bits (new seal 2016).Bimini top: Fixed sun awning for cockpitCapstans: 2 x Rossi aft deck mooring capstansOther: -Tender launching and recovery pole.- Sun bathing cushions.-16 Fenders (assorted sizes)-2 x 4.5 meter hardwood fender boards, stored in dedicated racks-2 x Boat hooks-PVC covers for all exterior deck equipment-Set of signal flagsTENDER AND TOYSTenders: 2 x Tenders: Williams 5.0m Yanmar diesel Jet Drive-Side whips and running rigging for both tenders.- Hull door fueling station for tenders with pump, counter, and variable speed nozzle.Toys: Extensive snorkeling inventory.Wakeboard, waterskis, inflatable towing toys, and sports life vests3 x inflatable kayaksDive equipment: Bauer Capitano C3E dive compressor with remote filling manifold at dive stationSAFETY & SECURITYEPIRB: TRON 40S MK2 Cospas/SarSatLife rafts: 2 x RFD 20 person Solas A life rafts, 1 x Plastimo 10 personLife jackets: 30 x SOLAS - approved lifejacketsFire–fighting equipment: -CO2 fire protection system.-Fire sprinkler system throughout accommodation areas.Ship alarms: General Alarm Intruder alarms: Watertight door proximity switch alarmsBilge & fire pumps: New Emergency Fire Pump (Gianneschi & Lombardi diesel) plus pipework (intake and feed to main 2015/2016) signed off with ABSSecurity cameras: Techno Leader Monitoring SystemOther: All safety equipment as required by class and MCACOMMENTSLike all Perini Navi sailing yachts, Phryne is designed and equipped to sail safely around the globe in extreme comfort or entertain royalty at anchor off Monaco. Many of her sisterships have done both. After a trip to New Zealand and back, Phryne's recent cruising has been seasonal use in the Mediterranean. She has always been maintained to the highest standards by her original owners and professional full time crew.